There has been much talk about art washing in the cultural press over recent months, but less about the people who literally keep London’s art spaces clean. This morning’s press view for the unveiling of Goldsmiths Centre for Contemporary Art (CCA) was disrupted by a small but loud group of students protesting the mistreatment of outsourced cleaning staff at the London university. 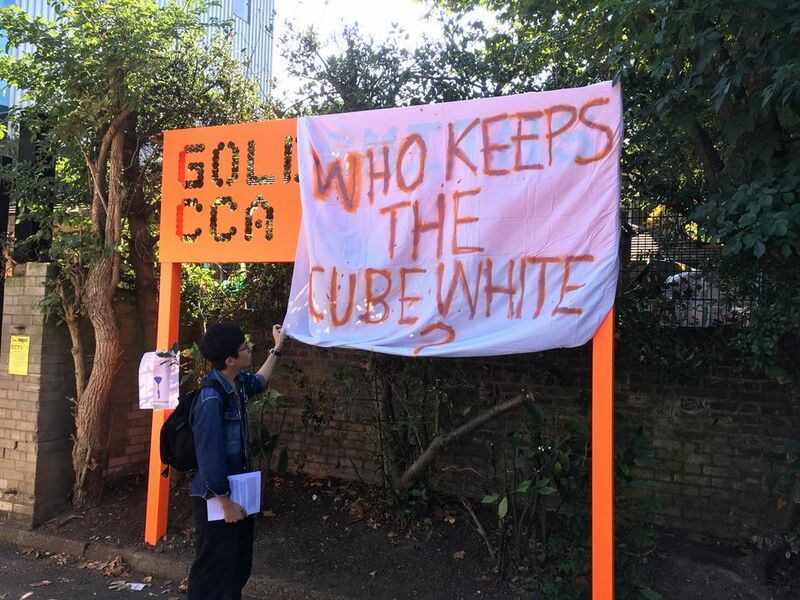 The group blew vuvuzela horns, handed out leaflets, and covered the gallery’s new sign with a banner reading: “Who keeps the cube white?”, forcing the media to access the new £4.5m building via a back entrance. According to one of the protesters, the Justice for Cleaners campaign is looking to put pressure on the university not to renew its contract with the cleaning company ISS when it expires next month. Instead, they are urging the university to bring the employment of the cleaning staff inhouse. Unfazed by the protests, and speaking inside the new spaces, the head of Goldsmiths’s art department Richard Noble, said this was “fairly typical for Goldsmiths” and that the protesters would not be disrupted. The university has reputation for a loud and political student body, with a healthy history of protest. “This is the context in which the gallery has been created,” Noble added. The New York-based artist Mika Rottenberg, whose exhibition inaugurates the space, has also lent her voice to the campaign with a statement of support, “especially given that my work deals in parts with hidden labour”. The protests are due to continue tomorrow during the private view, and the gallery opens to the public on 8 September.